Eight New Restaurants You Have to Try in Raleigh, N.C.
Raleigh, N.C., has a constantly-growing culinary scene, and we&apos;ve put together a list of some of the newest spots so you can stay in the know! From the creators of Bida Manda, brother and sister Vansana and Vanvisa Nolintha, Brewery Bhavana is a brewery, taproom, dim sum restaurant, library and flower shop all in one. Ultimately, it&apos;s a gathering space welcoming people from all walks of life, backgrounds and futures. The space is open with a large conservatory skylight and a lotus chandelier. A marble wall with more than 20 taps pours delicious beers created by head brewer Patrick Woodson, all of which pair perfectly with dim sum options like shrimp and fresh corn dumplings, steamed pork buns and fried rice topped with a soft egg. Also, surround yourself with books and flowers as you enjoy beers that perfectly compliment the lovingly-crafted food at Brewery Bhavana. Vidrio (pictured in the header) is a Mediterranean-inspired, two-story gathering space in the Glenwood South entertainment district. The walls of the main dining room are adorned with nearly 400 stunning, handblown glass pieces. Vidrio&apos;s small plates are great for sharing with a group of friends, and a few favorites include the Moroccan beef skewers, stone-hearth flatbreads and heirloom vegetables. With more than 50 wines on tap (and 300 bottles available), N.C. beers and craft cocktails, Vidrio also is the perfect place to grab a drink. Vidrio is open for dinner seven days a week and welcomes private events. 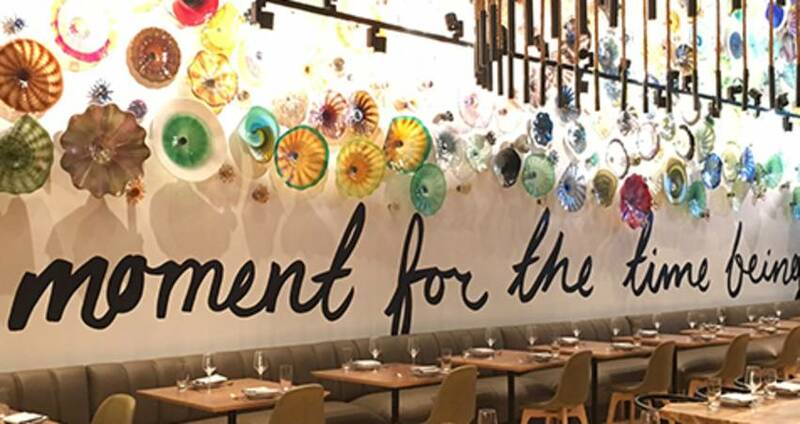 Located at the AC Hotel Raleigh North Hills, Level7 is Raleigh&apos;s distinctive, energized space for tapas-style bites and samplings from small batch distillers, brewers and single vineyard labels. With a flavor all its own, Level7 is a European-inspired experience with N.C. spirit and Raleigh soul overlooking the North Hills area. Enjoy a drink and tapas on the rooftop! Latin America cuisine awaits at so•ca in Raleigh. This new restaurant from the owners of bu•ku brings the flavors of more than 20 countries to Cameron Village with a large selection of Latin-inspired street and Caribbean soul small plates, as well as large entrees. Bring a group to mix and match multiple dishes like the ceviche de camarón, Trinidad doubles and Jamaican lamb patties. The cocktails are stellar and the Rum Diary featuring dark rum, fresh pineapple, coconut milk, habanero, citrus and bitters is not to miss! Plus, don&apos;t skip out on dessert; the Videri Colombian chocolate mousse will certainly satisfy any chocolate lover. Located in the heart of downtown Raleigh, Trophy Brewing Company&apos;s Trophy Tap & Table is one-part craft beer bar, one-part Southern-inspired kitchen. A diverse menu coupled with a rooftop patio and event space offer up an awesome downtown dining experience. Rotisserie chicken is a big focus, and is served with your choice of homemade sauces like the Alabama white, beer mustard or spicy sambal. There are also great options for vegetarians like the papaya BBQ jackfruit tacos, which are served with your choice of a side like apple slaw or plantain chips. Tap & Table is always cranking out creative beers from their ever-changing draft list, so make sure to grab a pint or a flight and head straight to the rooftop on a warm day. Delicious drinks, hot dogs and a great view! The Cardinal is quickly becoming a go-to spot in downtown Raleigh. If you&apos;re looking for a fun date spot that won&apos;t break the bank, grab a hot dog and a beer while you enjoy a view of the city skyline. The Cardinal&apos;s menu is pretty simple; "free stuff" includes hot dog toppings like sriracha and ketchup or for a few cents more you can upgrade your toppings to cheddar cheese, beer onions, jalapeños and more. Try their daily specials, which are usually fun spin-offs of fast food menu items like the "McCardinal Riblet" or "Big Cardinal." Nine Divine Pies in Raleigh, N.C.